It seems as though the first day of March arrived just a few days ago. But a glance at the calendar shows me that almost the entire month of March has passed. Just like that. In a flash. Where, oh where does the time go? Remember how when were were kids, those six weeks between Thanksgiving and Christmas dragged on forever? And summer vacation seemed so long, I was always happy when it was time for school to begin again. Boy, has that ever changed. As I have slowed down, time has sped up.The slower I get, the faster time goes by. Is this change in the perception of the passage of time a practical joke played on us by special relativity? Is there a cure? 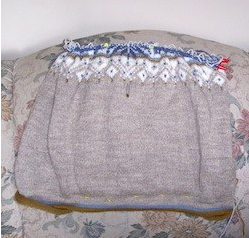 March has been a productive month for knitting. 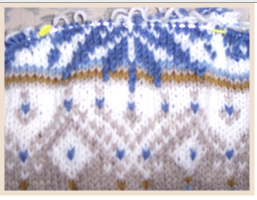 I’ve been working on St. Moritz and making pretty good progress. 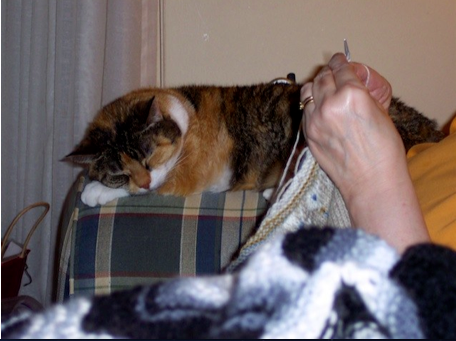 My beautiful 16-year-old calico cat Loretta helps me every evening when I settle into my knitting chair. I really don’t know what I would do without my knitting. It helps me keep my sanity in a country gone mad. The Congress passed a much needed health care reform bill that will prevent insurance companies from excluding pre-existing conditions and dropping people when they get sick, that will help middle and low income individuals and families pay for health insurance, that will require health insurers to cover preventative care, and what happens? Some members of Congress who supported the legislation are subjected to the vilest of racial slurs and threats of violence against them and their families while other members of Congress who opposed the legislation actually urge these despicable morons on. It’s shameful. But, sadly, the Republican Party has been getting progressively more shameful ever since it was taken over by the extreme right wing. But the bill has passed, in spite of all the lying and obstruction from the Party of No, and the mainstream media have finally been reporting what is actually contained in the bill and how it will affect average Americans instead of reporting what the opposition said was in the bill, Now that people realize that this bill benefits them and their neighbors, that it doesn’t raise taxes on the middle class, and that, contrary to all the rhetoric they have heard, it doesn’t include death panels or provisions for killing Grandma, support for the legislation has risen. It’s not a perfect bill. In my opinion it doesn’t go far enough. But it’s a pretty good bill, and it’s a base upon which we can build an ever-improving health care system. And maybe one day this country will have the universal, single-payer health care system we need and deserve.